Enviro-One Green Cleaner is a silky golden non-toxic liquid soap powerful enough to completely free your home from all toxic cleaning chemicals including your everyday laundry detergent, dish washing soap, floor cleaners, and more. If you think that’s great, listen to this. It can also be used for bathing, washing your hair, and even brushing your teeth. WOW!. 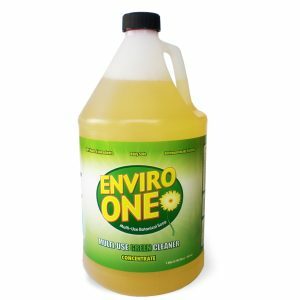 Enviro-One Green Cleaner is made by the makers of Botanic Gold (formally PureTec International / formerly Planet Solutions). The goal of PureTec International was to produce a chemical free cleaner that can replace all harmful chemicals from our homes, workplace and environment. Enviro-One Green Cleaner is derived from the latest scientific breakthrough. 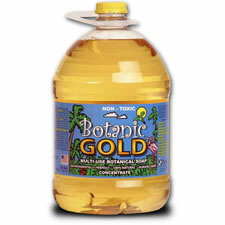 It effectively breaks down oils, dirt and removes bacteria without using any harmful chemicals in the process. This is why even though it is strong enough to clean hard engine grease, it is still safe to wash a baby’s bottom. This all purpose non-toxic soap cleaner is used by and is safe for people that are extremely Multiple Chemically Sensitive. One of the preferred uses for the health conscious is washing their fruits and vegetables. No matter what your looking for, this all purpose soap does it all. Enviro-One Green Cleaner: Purified water, fatty acids, folic acid, minerals and enzymes derived from edible and seed bearing plants. Using this product is simple and easy. Enviro-One Green Cleaner comes in the concentrate and has different dispensers that make its usage even easier. To use, just add water. It’s that easy. > 15 to 1 for Fruits and Vegetables Washing. To order Enviro-One Green Cleaner and NEVER use harmful chemical cleaners again, call us TOLL FREE at 1-800-953-2630 or you can Order securely via the internet by just clicking here!